Our doctors are experienced in treating more serious deep vein problems. What are deep vein problems? These conditions typically involve the deep veins in the leg muscles or the large veins located in the pelvis and abdomen. These are typically more serious conditions requiring treatment in specially equipped offices (offering a special type of x-ray called fleuoscopy) or in the hospital. Just like when there is pain from blockage of the arteries in the legs blocked deep veins can cause leg pain too. The blood cannot get back to the heart to recirculate and backs up causing the leg to swell and be painful. 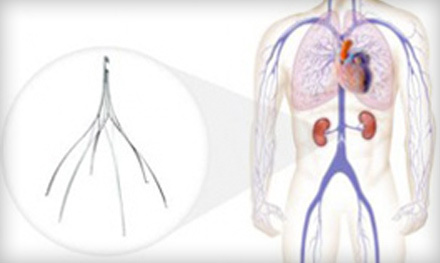 The most common problem would be a blood clot that has formed in the vein blocking the flow. Depending on where the blockage is treatment would consist of putting the patient on a blood thinner to prevent more blood clots forming and doing blood work to see why a clot formed in the first place. If the blood clot is higher in the leg it may be best treated with placing a small catheter directly in the blood clot and dripping in some clot dissolving medicine. This treatment has been shown to be very effective and help prevent serious chronic leg problems call “post phlebitic syndrome” where the leg never returns to normal and patient suffers from chronic leg swelling and pain. – Blood clots forming in deep vein. What are vein conditions of the pelvis and how are they treated? May-Thurner Syndrome is a vein condition of the pelvis. This is where the artery in the pelvis crosses over the vein causing a partial blockage. Eventually, a scar may form and further block the vein. This blockage causes blood to back up and increases the likelihood of blood clots forming in a patient’s legs. These clots, in turn, can cause severe leg swelling and pain. May-Thurner syndrome is best treated by dissolving the existing blood clots and opening the blocked vein with balloons and stents. Just as there are leaky veins in the legs that can cause leg pain there can be leaking veins in the pelvis in some women causing them pelvic pain as well. This can sometimes be difficult to diagnose and may require CT scan, MRI or even venograms to evaluate whether there are leaking veins. If leaking veins are found they can be treated by isolating the vein and blocking it using a small catheter. 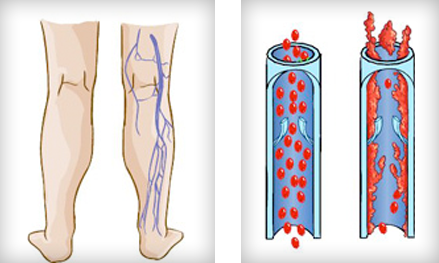 Blood clots in the deep veins of the legs can be a serious condition, especially if they travel to the lungs. If a patient cannot be treated with blood thinners or has failed such treatment a filter (IVC Filter) is sometimes required to be placed in the main vein in the abdomen to catch and stop any blood clots from getting to the lungs where they pose the greatest risk to a patient’s health. How do I know if my condition requires a more aggressive treatment? Each patient’s situation is unique and treatment options will be explained by our experienced doctors. It is important that all patients understand and are comfortable with their treatment decisions. Midwest Vein and Laser provides free screening to determine treatment options to all patients.